New York City’s attractions are world-renowned – the Big Apple able to boast more things to see and do than perhaps anywhere else on Earth. During our recent trip, alas, our schedule allowed no time for sightseeing. But had we had enough time, our first port of call might have come a little out of left field. Penn Station does not often feature on Manhattan’s must-see lists but for us, there can be no more spectacular sight in all Five Boroughs than this ever-bustling transportation hub. Call us strange, but the departure board inside Penn Station is a particular favorite, featuring towns and cities both far and distant, displaying destinations right across the United States that can be reached from this otherwise-unremarkable starting point. From here, countless connections can be made. Connection, as you’ll be aware, is our thing. Penn Station serves more than 300,000 passengers a day, its tracks stretching out across the nation like threads, tying the United States together, shrinking the country, connecting the people in it. From here, you can head south to Florida, north to Canada or West to Chicago and beyond, a gateway, opening up, from coast to coast and all points in between. People inspire our project – our OMs – and millions upon millions make these journeys from Penn Station each day, to destinations different and disparate. In this way, their lives interlink, their tales intertwine. For stations are stories, on platforms are people, on concourses connection. Imagine then, if this spread outside the United States – if these threads could reach beyond borders, underneath oceans, across continents. That, that’d take connection to another level. It sounds far-fetched, fantastical even, but it could soon become real. You see, discussions have been held in the Kremlin in recent days that could have connective consequences for people everywhere. From Saunderstown to Siberia, Rhode Island to Russia, connection could soon have an altogether different meaning. You see, plans are afoot to dig a rail tunnel beneath the Bering Strait, linking Asia and the United States, allowing, in theory, travellers to make a seamless train trip from America to Europe. This $100 billion scheme is being described as the greatest railroad project of all time. There are three distinct stages involved in this ambitious undertaking: extending Alaska’s existing tracks to the West, adding to the fabled Trans-Siberian Railroad and, most challenging of all, constructing a 106 km tunnel to join the two. East and West would meet at the international dateline, beneath the Bering Strait islands of the Russian Big Diomede and the US territory of Little Diomede. In theory, it could soon be possible for us to catch a train right here in Rhode Island that’d take us right into Manhattan, to Penn Station, and then on, through the United States and Canada, beneath the Bering Strait to Siberia and beyond. Imagine taking a train to Moscow! The people. The stories. The connections. 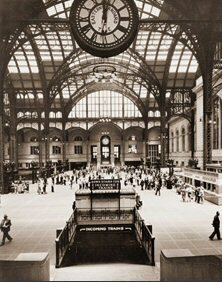 If nothing else, Penn Station’s departure board would be a sight to see! Tsar Nicholas II first mooted a Bering Strait tunnel in 1905 and, 106 years later, his dream might at last be realised. President Medvedev has given it his backing and so have we! You see, connection comes in all forms, from the spiritual to the physical and here in Saunderstown our interest is in them all. Continental drift has wrenched our countries apart over the years, but let’s not forget, Siberia and Alaska were once joined. They can be again.